Maintaining decorum and civility during the course of legislative committee meetings is the cornerstone of a productive hearing on the bills before that committee. Persons who come to testify on legislation and those who attend a committee hearing to peacefully observe and listen to the proceedings often travel long distances to the Capitol on the day of the hearing. Everyone attending can reasonably expect that the meeting will proceed in an environment of mutual respect among the legislators, witnesses, and audience that is free from disruptions. One commentator has observed that “[p]reventing disturbances at public meetings is essential to achieving the dual goals of fostering citizen participation and ensuring the efficient accomplishment of public business.” (“Civility in Government Meetings: Balancing First Amendment, Reputational Interests, and Efficiency.” 10 First Amend. L. Rev. 51 (2011)) The right to attend and participate in a committee meeting is necessarily balanced with the committee’s right to ensure that its proceedings are not disrupted. But legislative committee meetings are occasionally disrupted by verbal outbursts, such as cheering, booing, shouting, or applauding, by persons attending the meeting. Signs, clothing, or distracting electronic or photographic equipment may have a similar, if less audible, disruptive effect on the ability of persons to freely testify on legislation. These distractions illustrate the need to balance the public’s right to freedom of speech and to petition the government with the right of the legislative branch and committee witnesses to engage in a process that ensures decorum and civility. 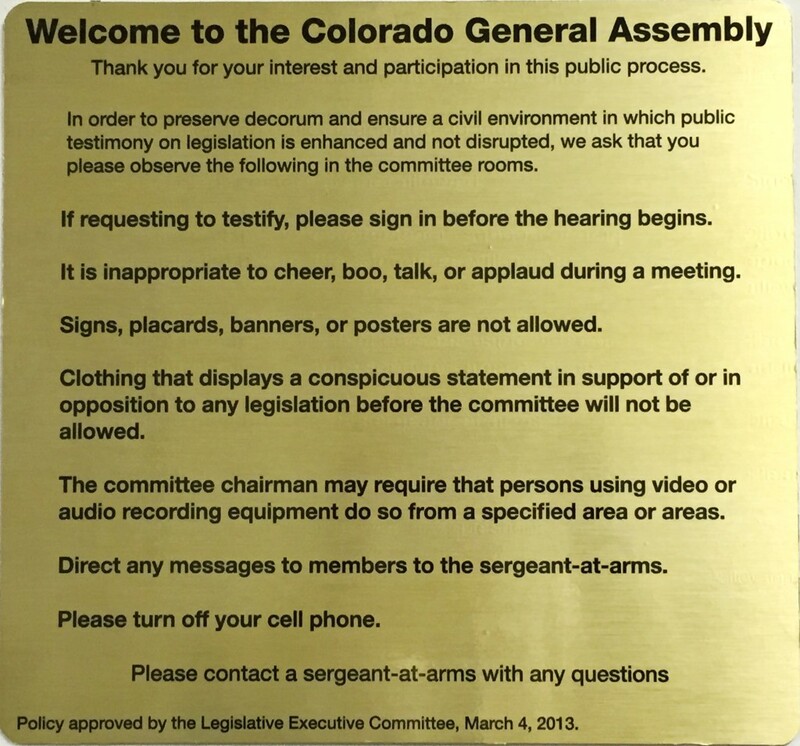 The Colorado constitution, state statutes, and legislative rules all authorize the General Assembly to preserve decorum generally and in legislative committee meetings specifically. Article V, section 12 of the constitution authorizes each house to adopt rules that address disorderly behavior and enforce obedience to its process. Addressing any other matters that may be appropriate for the orderly conduct of the General Assembly’s affairs and protection of the health, safety, and welfare of all the participants in the legislative process. Senate Rules 22A and 31 and House Rules 23 and 25 address decorum in the chambers and committee rooms. House committee chairpersons are specifically authorized to have a sergeant-at-arms remove persons who impede, disrupt, or hinder a meeting or endanger the meeting’s participants. The Senate does not have a similar rule, but Mason’s Manual of Legislative Procedure, section 805, suggests that Senate committee chairpersons also have this authority. Fortunately, removing a person or persons from a committee hearing for disruptive behavior occurs very rarely. Before 2013, the Chief Clerk of the House of Representatives and the Secretary of the Senate each developed policies for the use of committee rooms. Each policy prohibits signs, placards, and banners, as well as clothing with words, pins, or buttons that express support or opposition to issues before a legislative committee. During the 2013 legislative session, Senate and House leadership directed staff to post the “Welcome to the Colorado General Assembly” signs in the hallways outside of the Senate and House committee rooms. Legislative staff have also created a “Guide to Public Hearings” to supplement the signs. It’s available under “General Legislative Information” on the General Assembly’s website. So, welcome to the Colorado General Assembly! Hopefully, the information in this article will help ensure that, whether you are coming to the Capitol to testify on a bill or just watch a committee meeting, your experience will be respectful, civil, and free from disruption. Previous Post: Statutory Construction: What was the General Assembly Thinking?